Diabetes In Cats. 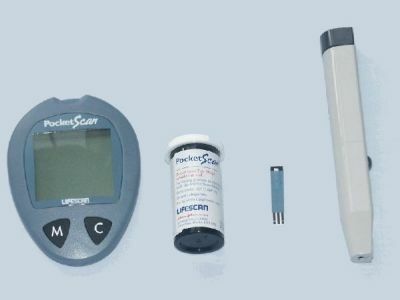 How to test blood sugar levels at home. Blood testing at home is a surprisingly simple four-step process. It will probably take you a few tries to get a reading, but you will soon get the hang of it. Don’t be disheartened if you don’t get it right straight away, I don’t know anyone who got it right first time and there are plenty of variations for you to try. It’s just a matter of finding the method that works for you. Whichever blood glucose monitor you get, read the instruction book thoroughly before you go anywhere near your cat, and practise taking your own blood glucose reading first. Get as familiar with it as you can before you try it out on the real thing! If at all possible, get someone to help you blood test your cat. This is because the first couple of times, you will feel like you don’t have enough hands! In the long term it would just be useful to have a second person who could also do blood tests if necessary. Last but not least, your diabetic cat! Prick the marginal ear vein with the penlet device. Allow blood drop to form and transfer to blood glucose monitor. Leave monitor to count down and take your reading. 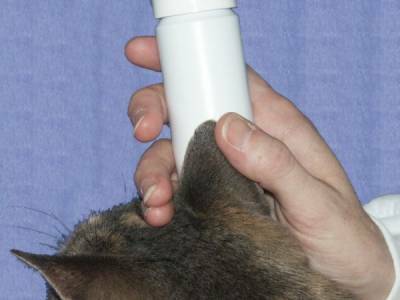 There are a number of methods for heating up your cat’s ear - I use an old plastic vitamin bottle with hot water in it. It fits snugly inside the curve of the ear and is easy to hold in place while the ear warms up. Count slowly to about 30 seconds - it’s most important that you DO NOT RUSH this stage. If you’re nervous you will want to hurry, but fight that impulse and you are more likely to be successful. How ever you heat the ear, you’re aiming for comfortably hand-hot - not scalding, blister inducing hot. You just want to make the ear nice and warm so that you’ve got a good blood flow. If you’ve ever seen your cat sunbathing, or lying in front of the fire toasting their toes, you will have seen the marginal ear vein. It’s the tiny vein that runs around the perimeter of the ear. If you can’t see it, shine a torch through you cat’s ear, or sit them under a bright light. You are aiming for anywhere along the outer edge, below the apex and above the curly lobe bit at the bottom. If anyone knows what that bit is called, please let me know! Updated January 2009. Thanks to Anita, I now know that the curly bit is called the marginal cutaneous sac. Thanks Anita! The cotton wool isn’t essential, but some people find it helpful. You might find that without it you also draw blood from yourself! I just use my finger on the other side of the ear - but do whatever you feel most comfortable with. 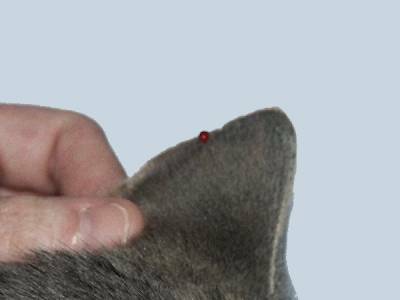 When pricking the ear vein I hold the ear between my thumb and index finger - DON’T LET GO when you’ve pricked the ear or your cat will shake its head and you’ll lose your precious little blood drop! 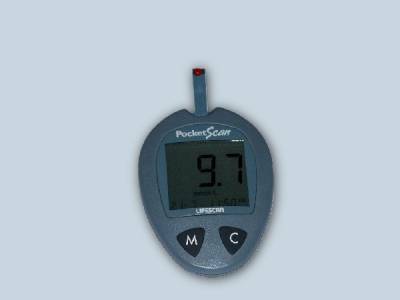 Wait a couple of seconds for a little drop to form, and transfer it to blood glucose monitor. Initially I had a tendency rush the transfer to the test strip - you need to wait a couple of seconds for a little drop of blood to form first. Otherwise you won’t get a big enough sample for an accurate reading. If there doesn’t seem to be enough blood, gently massage the ear below the drop to encourage a bit of blood flow - a couple of gentle squeezes should do the trick. Put the monitor to one side to do its thing. Whilst it’s counting down, hold a tissue over the spot on your cat’s ear to clean off any residual blood specks. You’ll find that it won’t be bleeding by the time your meter has finished counting down. Most important, give your cat a big fuss for being such an angel about the whole process! If your cat is already warm, has been sunbathing or lying in front of the fire you may not have to heat the ear first - they may already be warm enough. Only trial and error will tell, and you’ll quickly know by feeling whether you need to heat the ear or not. If you have a microwave, you can put a wet face cloth in a plastic bag and heat it up for a few seconds. I have also heard of people putting rice in an old sock and microwaving that for a bit - whether it’s cooked or raw rice I don’t know! Update August 2013. Thanks to Amanda, I now know it's uncooked rice. Amanda very kindly dropped me a note and said “It's uncooked. We use large tube socks with a large quantity of rice for our human aches and pains, but to make one for kitty, find a toddler/kid's sock, and add a couple of tablespoons of uncooked long-grain rice. Knot off the top, and heat for a few seconds (Our microwave uses 15 seconds, yours may need more or less time!). That's all there is to it. It may 'shed' for a few uses, the little tops of the grains breaking off and working their way through the weave of the sock, but once that's done, it'll last a really long time. One of our human rice socks has been used for over 5 years, and it's still going strong! ” Thanks Amanda, much appreciated. I've had an email from Steve telling me about a heating method that works for him and his cat Peggy. Steve writes: “Another way to warm a cat's ear, and one that works best for my cat, is to place a directional desk lamp near her ear. However, before recommending this particular method to anyone else, it comes with a big warning - desk lamps can get VERY hot!! The instructions with the lamp I use warn not to leave the lamp within one metre of any other object for this reason. For Peggy, I use it for a few minutes at a distance of about half a metre, but always watching for any sign of discomfort from her. This approach works best for her because it is completely non-invasive, and she likes having a 'sun-lamp' treat.” Thanks for writing Steve! Some cats don’t like the noise the penlet automatic blood sampler makes - the little spring inside that activates the lancet startles them. You can try removing the lancet and using that to prick the ear - but BE WARNED - you need to be very gentle. The one and only time I tried this Paris yelped and I made a big mess. I’m obviously too heavy-handed for this method! I know some people use a surgical knife to make the smallest of cuts along the edge of the ear (and therefore don’t have to heat it beforehand) again, be very very gentle not to go too far. Don’t worry about being too accurate with hitting the marginal ear vein. I’m sure I haven’t hit it every single time I’ve taken a reading, but I’ve got my blood drop nonetheless. Just get as close as you can. Alternate between places on the ear and between ears, to allow the tiny hole to heal between testings. I received an email from Tim, who uses a small keychain type LED flashlight on the underside of his cat's ear to help him see he vein clearly. Tim says “It works great and there's no more guessing. It takes a little getting used too, but it is easier on the ear this way. If your flashlight is a push button you can free up your hands by wrapping a rubber band around it to hold the button in while you work.” Thanks for getting in touch Tim! Rather than using your finger you can put a cotton wool ball inside the ear and press the penlet blood sampler onto that when pricking - it’s up to you. 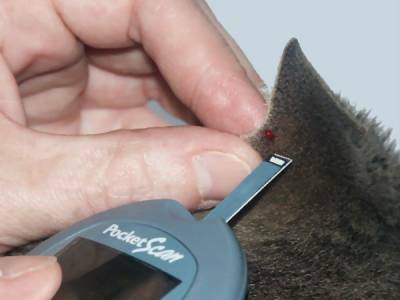 If your cat has very furry ears you might find that the little blood drop soaks into the fur which means you can’t transfer it to the test strip. If that’s the case with your cat, smear the tiniest amount of Vaseline on the ear margin first, so that the fur is smoothed down and the blood drop beads up in one place. 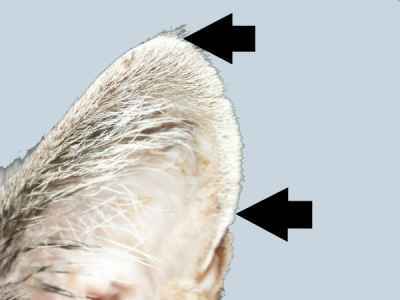 If furry ears are a problem, carefully trim away some of the fur from the edge, or if you’re nervous get your vet to do it for you. You will have to adjust these guidelines depending on the type of monitor you have. I know some monitors require the blood drop to be on the strip prior to the strip going into the monitor. Just read the instruction manual that goes with your monitor. If you don’t get enough blood on the strip so that your monitor doesn’t count down, you cannot add blood to the strip. Get a new one out and start again. 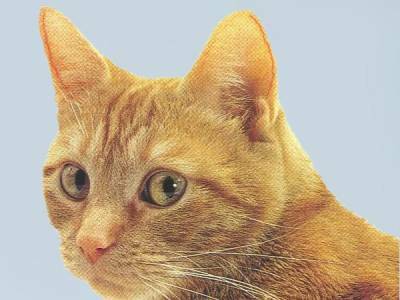 Get your cat used to the penlet device by clicking it randomly when your cat’s about - it might stop them being startled by it when you come to do a blood test. If you don’t normally play with your cat’s ears, start now! Get your cat used to having its ears touched and played with. Also try heating up your cat’s ear whenever you think of it without actually testing. Again, this is to acclimatise your cat to the sensation. Your cat will no doubt think you’re quite odd, but I have a feeling they think this about us anyway! Be as "matter of fact" about the whole process as you can and your cat will be too - they really do pick up on our feelings and if you’re anxious your cat will probably act up. Restrain your cat as little as possible during the testing process. I’ve always found with my two that the more restrained they are, the more they struggle. Try to get away with just holding the ear you’re actually testing. You won’t get a blood sample the first few tries. You’ll be all het up and your cat will be hiding under the bed in disgust. Don’t give up. Try again later, or the next day, but don’t give up. Talk gently in a soothing voice while you do the test - it does make a difference.